Abdomen - Round and can be yellow, tan or slightly green. Cephalothorax - Tiny. Usually a tan color. Bite Info - Believe it or not, these little guys are one of the more dangerous you will find in Michigan. 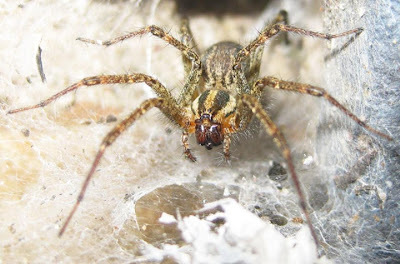 They are the most common spider to be bitten by and their bites are sometimes mistaken for that of the Brown Recluse. Although their venom is not nearly so dangerous as the Recluse, the bite can sometimes leave heavy swelling and even leave open sores. THere is a lot of bad info on the net that states that the Yellow Sac Spider uses the same cytotoxin as the Recluse does, but not as potent. I have recently learned from Rick Vetter, the top Brown Recluse expert in the world, that this is not true. This bad information was started by someone who was looking to gain from causing fear. I am one of those who fell for this bad information and helped spread it. I apologize for that. Other Notes - During the daytime these spiders often hide in a small blanket of web under leaves and wood, but often will make their way into homes and hide in corners or under window sills. 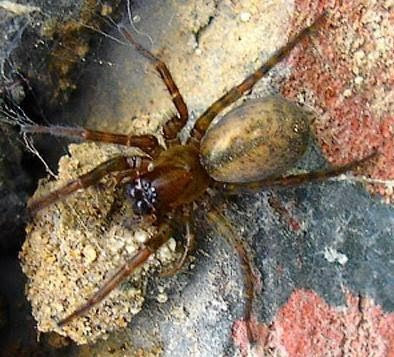 Also known as the Vibrating Spider, Cellar Spider and the House Spider. Bite Info - It is debatable if the Daddy Long Legs can even bite humans. I have heard Myth Buster proved they can bite but it was very minimal and the feeling only lasted a few moments. Whatever the answer, the fact is these spiders are virtually harmless to people. 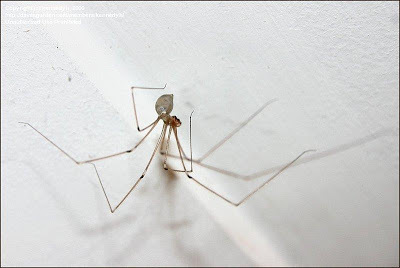 Other Notes - The Daddy Long Legs often hang in webs in corners of rooms. They are commonly found in the corners by the ceilings as well by the floors. Unlike most spiders, these hunt and feed on other spiders. In states where there are more poisonous spiders like the infamous Black Widows and such, the Dadday Long Leg spiders are actually good to have around. Myth - The popular myth running around is that the Daddy Long Leg is the most venomous spider in the world but that its fangs are not strong enough to penetrate human skin. This belief is not true. Cephalothorax - Fuzzy with a striped pattern running from front to back. Male Size - Their bodies average between 0.5 inch to 0.75 inch long. The largest of these that I have seen personally was one I caught in the basement of an apartment I lived in. The body alone was just under the size of a quarter. Other Notes - The Grass spider is commonly mixed up with the Wolf Spider. The two spiders have very similar markings but usually the Grass Spider has two or three stripes on its back where the Wolf Spiders stripe (if it has any) is usually more of one dominant stripe. Don't mix that up with the Nursery Web Spider though. The three most positive ways to tell the two apart however are 1) The eyes. Grass Spiders eyes look sort of like two rows of four eyes, one above the other. Both rows are curved and all eight eyes are generally near the same in size. ...2) Grass Spiders have longer spinnerets on the back of their abdomen. Wolf Spiders do not have as long spinnerets because they do not spin webs except to protect their eggs. 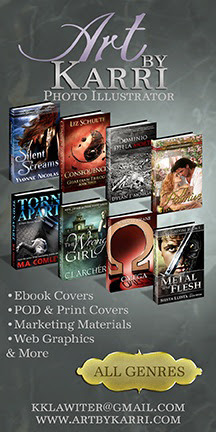 ..3) The Web! Grass Spiders have the flat horizontal web that ends in a funnel shape. The Grass spider is also referred to as the Funnel Spider for the funneled portion of its web that it hides in. These are very quick spiders and often you might find them running across your floor in the fall time. The common belief is that they come indoors during the fall because they are drawn to the warmth but the fact is the Fall is their mating season and the males will leave their nests in search for a mate. Cephalothorax - Shiny and can be two toned. The Hacklemesh Weaver is of the Coras genus in Spiders. There are fifteen different species of the Coras. We verify your IP against blacklists to avoid spam on our blog and forum. 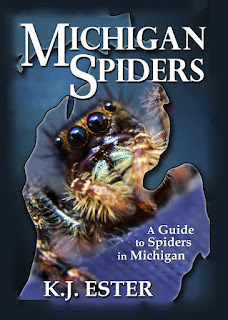 If you are using automated means to spam or disrupting service on Michigan Spiders we will submit your IP, log in name and any other information we collect to appropriate parties. This may include local authorities or websites tracking spam such as HoneyPotNet, Akismet, and StopForumSpam. It is possible we may be using Cookies and/or Web Beacons here at Michigan Spiders but in all honesty, it is not my intent if so. It would be something that happens beyond my limited Blogging knowledge.